Updating your home’s interior with a fresh coat of paint? The proper technique is key to a flawless finish, so read on to discover how long to let your paint job dry. Q: I’m about to refresh my living room walls, but I’ve seen different opinions on how long to wait between coats of paint. How long does it take paint to dry? A: You’re smart to check! 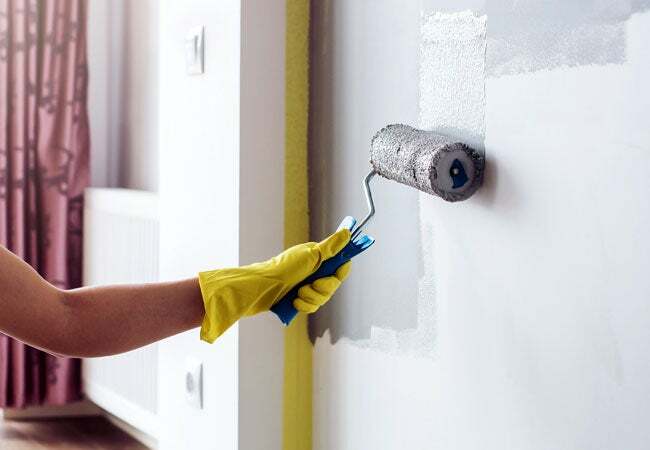 Allowing paint to dry between coats helps prevent uneven texture and visible smudges—sloppiness that you certainly won’t want marring the product of all of your hard work. Generally speaking, the necessary dry time depends on the type of paint you’ve chosen. Latex paints tend to dry more quickly than their counterparts; a coat usually takes about an hour until the paint is no longer wet to the touch and four hours until another coat can be applied on top of it. Oil-based paints, on the other hand, require up to six to eight hours to become dry to the touch and 24 hours before the next coat can be applied. Paint type is only a small part of the equation, though. Consider the other factors listed here, as they affect dry time as well. High humidity equates to longer dry time. 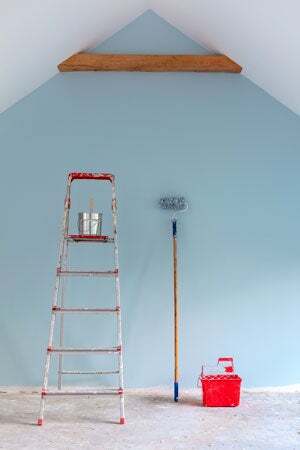 The more humid a room (in other words, the more moisture in the air), the longer the paint in it takes to dry. A paint’s water content won’t evaporate as easily in high humidity, thus prolonging the period of wetness. Ideally, try to paint in rooms with 50 percent humidity or lower for the fastest drying time. Temperature can also affect your painting project. If you’re using latex paint, you’ll want to work in temperatures of 50 to 85 degrees Fahrenheit. If you’re using oil-based paint, the ideal temperature range runs from 40 to 90 degrees Fahrenheit. You’ll likely be painting in a home with air conditioning that allows you to maintain a consistent temperature. However, if the project is an exterior paint job or interior but without working utilities, avoid painting on very hot or very cold days. Working in temperatures outside of the recommended zone can slow down the evaporation process, causing paint to dry noticeably slower. Consider a room’s ventilation. If undertaking a painting project in a poorly ventilated room room, expect the paint to take longer to dry between each coat. The fresh air of a well-ventilated space encourages the water molecules to evaporate and the paint to cure. Choose your application method carefully. For fast-drying results, use a paint roller and take care to apply each coat with an even hand, resulting in a consistent finish without gloppy edges or runny streaks. Using a brush leads to thicker coats of paint, which may add an extra few hours of drying time. Always try to paint in optimal conditions. Follow the instructions provided by the manufacturer for the specific paint you’re using, and pad the time frames a little bit to be safe. If you’re operating in a less-than-ideal environment (like a room with inconsistent temperatures, poor ventilation, or high humidity) then think of the manufacturer’s instructions as a baseline, adding as much time as necessary to avoid the unflattering finish that comes with applying a second coat of paint too quickly.